This dress is so cute! Easily dressed up or down when styled differently. The length is super appropriate but still "short" above the knee. The material is rich and buttery. I purchased this dress with an engagement party in mind but it's definitely something that could be worn to dinner, work with a blazer, or even a wedding. This dress is so pretty and very flattering. I sized down so that it wasn’t a draped fit. For reference I am 5’4” and 125 lbs. The only downside is it is very short. When standing it’s fine but too short for a work meeting and sitting requires careful strategy! Because I’m very short legged, it’s fine. Love this dress it look beautiful on me cnt wait wear it out on date with my handsome hubby. I got it red. I got one size up. Still fit awesome. 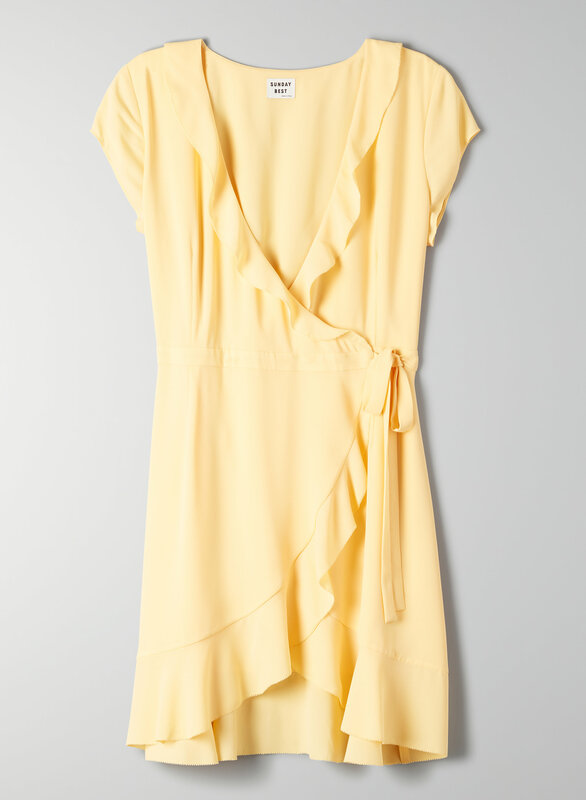 This is a very sweet dress for spring. Purchased it in the yellow. It is true to size, but the middle section is quite short. I managed to make this a bit more wearable (and less 'risky') by bringing the tie around to the right hand side, rather than the left. If you play with it a bit, you can make the fabric be a bit longer in the middle. Just be mindful of this. Think it's just the way it's designed. Honestly I don't know why it does not have 5/5 stars. I absolutely love this dress and I actually have it in four different colors and I'm so excited they brought more colors out! I always get compliments when I wear this dress. I have to say though it is a bit short but in a good way. So it's perfect for all the petite girls out there ;) Also, I have a big chest so it is a bit tight on my chest but nothing that I can't work with. Anyways, I know what Ill be wearing all summer :D !! This is sadly enormous. I got a 4 and I swam in it. Even so, it's not nearly as cute as this (super cute) model makes it out to be.